Last year for Christmas (2011) I gave my husband a quilt that was not completely finished. He had asked for a quilt he could use for the cool nights he spends on the boat. Of course, I thought it had to be “boaty,” so I borred an idea from a quilt my friend Eileen had made for her husband some years ago. Thus, “Bob’s Flounder Fantasy” was born. I bordered a turqoise blue fabric and sent it off to the longarm quilter for a water look quilting design. 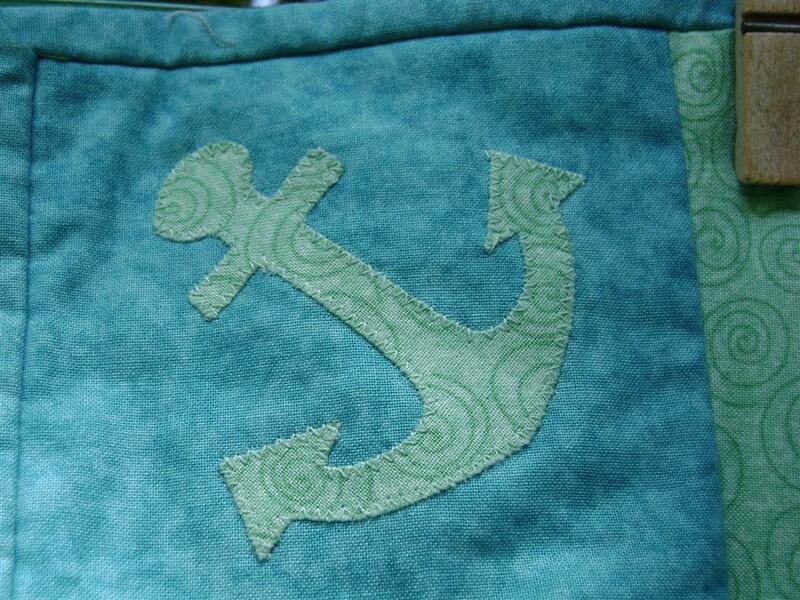 I machine appliqued anchors in the 4 corner blocks. I then chose different spotted batiks and machine appliqued with a zig zag stitch 23 flounders. Using striped fabrics, I added upper, lower and back fins. 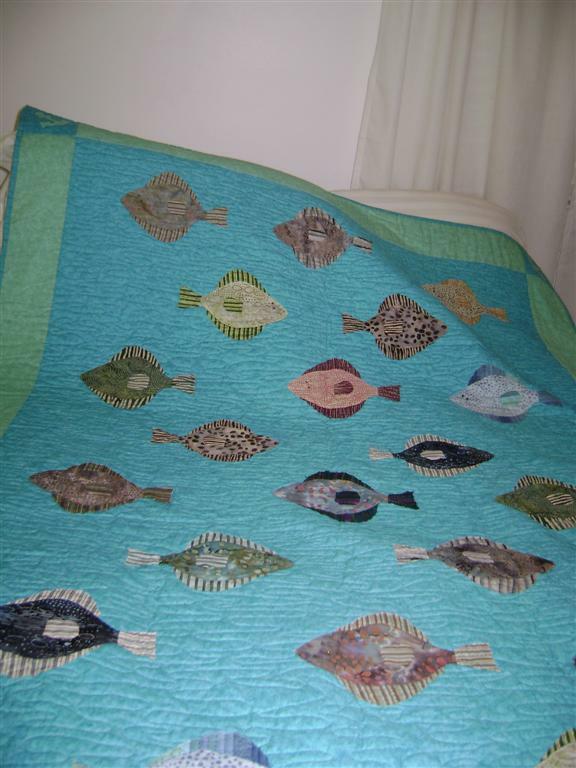 He received the quilt without the flippers – those had to be hand appliqued, and I never did find enough time to do it out of his sight. Silly me, little did I know that giving an unfinished quilt would leave me open to a request. “It needs embellishing – the flounder need eyes.” Off to the bead shop we went and chose beads – for all 46 eyes! Today I sewed the last flipper on. DONE! I hope to never again give an unfinished gift. Thank you Diane! It just feels so good to get it off my to do list! It looks great! 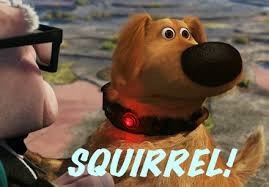 But what are you going to work on for the retreat next week? 2 or 3 of several dozen projects in the works! eyes or else how could they swim around…… Really like it. I had no problem with “artsy” blind fish – not only were there 46 eyes – but 2 beads for each eye! Hubby is happy thought, so I guess it was worth it.